Want to visit Croatia this summer? A very attractive small town in north-western Croatia, on the Adriatic sea. Welcome to our web page. 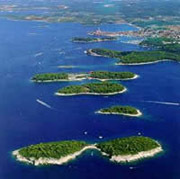 We are a family that offers apartments for rent in Rovinj, Croatia. We have been in this business for 19 years, by now, and have always had happy and satisfied guests. We have put this small site online just to show you our apartments and, obviously, tell you something more about why you should come to visit us and our nice country and region (Istra). What does it mean to "Rent an apartment"
Well, here in Croatia it is custom that if you don't want to spend too much to rent a Hotel suite, you can opt for renting a private house or a flat. So, imagine, you come to our place, we give you the keys of your flat, tell you where you can park your car and that's it. You have a home in Croatia for one, two, three or even more weeks. 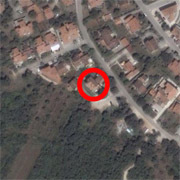 A home with bedrooms, kitchen, living room, TV (and beginning with this year, there will be broadband Internet as well). We will change your bedclothes and towels once a week, and take care of the cleaning after you leave. Furthermore, we can also prepare breakfast for you, if you wish. So why are you still waiting? Check our apartments and our prices, then pick up the phone and call us, or send us an email! We will be happy to answer any question and delighted to welcome you to our house. Apart from Croatian, we also speak Italian, German and English. And during your stay, we will be very pleased to help you organise your trips, choose the places to visit, select the best restaurants where to eat and help you in finding the answers to any other question you may have. 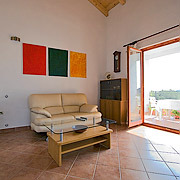 The house, recently renovated (2006) is set in a lovely environment with a beautiful view over the sea and the countryside. It is well located at only a few minutes walk from the most beautiful beaches in Rovinj, such as Skaraba, Punta Corrente (Zlatni Rt) or Cuvi. Here you can spend hours walking among the pinetrees, riding a bicycle on one of the countless pathways along the seaside, or simply lie under the sun in a "cala" of your choice. For sport lovers there is a well equipped tennis court complex and a gymnasium very near to the house (300m). In addition, in the nearby national nature reserve Zlatni Rt (Punta Corrente), there is a great number of bicycle paths and there is also an area equipped for free climbing, in an old rock quarry. The centre of Rovinj is at only 20 min. walk/5 min. by car. The airport of Pula is just 30 km away, while Trieste's airport is 100km away. To book an apartment, contact us to check if it's available in the week/s you have chosen for your holidays. If that apartment is free and you still want to place your reservation, you should then send 30% of the total cost of your stay on our international bank account. We will provide you with details by email or by phone. Otherwise, if the apartment that you have chosen has already been reserved we will try to make you an offer for one of the other apartments, or if you wish, put you on a waiting queue so that, if someone cancels their reservation, we could contact you again and make you another "discounted, last minute offer".